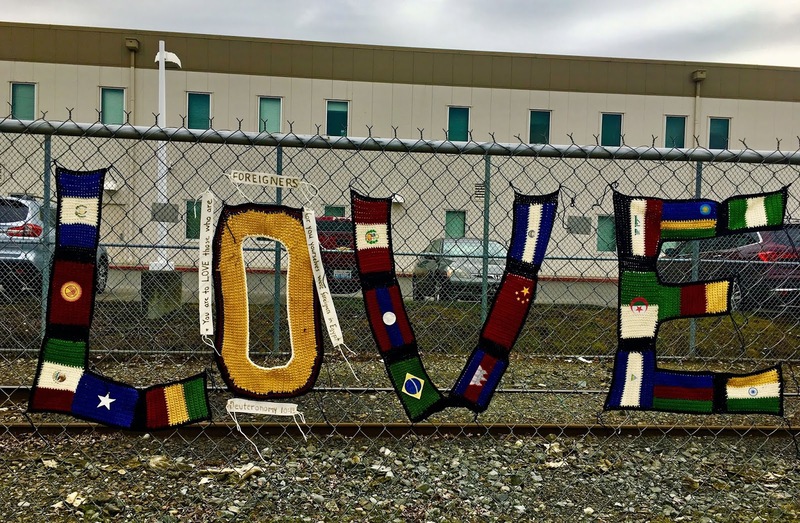 Somebody crocheted this colorful hanging of flags and mounted it on the chain link fence of the Northwest Detention Center in Tacoma. Several barriers and signs have been put up to prevent people from demonstrating on the area between the railroad tracks and the street. Here is part of my report of what happened when we worked outside the Detention Center in the beat up RV. 1 man from Mexico had a large extended family waiting for him in two cars. We met most of them eventually as they came to the RV. He had been a US veteran serving in Iraq and Afghanistan then got into trouble. His cousin's husband came in twice and made a donation of $40 and told interesting stories. Grandpa came by and talked about his life. 1 man from India wanted to go to the Sikh Center. He was pleased to get a new coat, some toiletries and a knapsack. We called the cab driver who came quickly to go to the Sikh Center. He REALLY wanted to get rid of the old sweatshirt he was wearing. He did an interesting farewell gesture including respectful bowing and touching your knee. The woman from Mexico had lived in the Seattle area for over 30 years. She got picked up in a court while paying a parking ticket. Plus her car disappeared! She made some fabulous if rather heartbreaking crafts including some rosaries carved out of soap, many crocheted items made with a crochet hook she made out of her toothbrush and some beautiful flowers made from toilet paper, sugar and color from crayons. What does this say about the quality of life in America's private immigration prisons? Her daughter finally made it through the traffic to pick her up and she was pleased with her new outfit she put together from the clothes in the back. Making flowers out of toilet paper and sugar? Having to make your own crochet hook out of a plastic toothbrush? Is anybody else outraged by this?